Is a new technological aid developed from a scientifically based Japanese acupuncture technique called Ryodoraku. It measures the skin resistance to minute electrical stimuli on specific acupuncture points to find out the state of the acupuncture meridians. It is used by some acupuncturists to analyse and document the Qi or energetic status of the acupuncture channels to make a diagnosis. According to this technique, some old methods of diagnosis (pulse and tongue) are not very accurate. By using AcuGraph together with traditional diagnostic methods, it helps the practitioner to better understand your unique condition and to provide the best possible treatment for you. At AcuBalance Center you will receive this service at no additional cost to you, and you may also receive recommendations for life style and dietary changes free of charge, along with your AcuGraph. 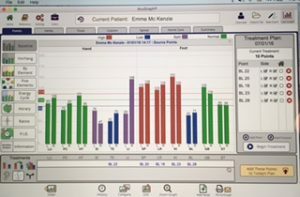 After your treatment you will receive a Report with a copy of your graph.